After working with a variety of physicians and specialty care groups on back-office functions, we have discovered one universal truth: most physicians prefer serving patients than dealing with accounting. However, staffing, processes and collections are critical to a profitable practice. 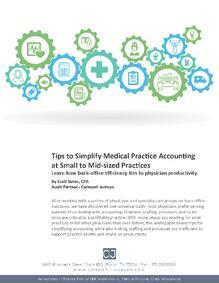 With more physicians working for small practices or for other physicians than ever before, this whitepaper shares tips for simplifying accounting while also making staffing and processes more efficient to support practice profits and physician productivity.